I dont particularly care for the original Sleuth, a Broadway/West End concoction far less clever than it would have you believe. Still, I can see why people like its flamboyant hambone theatrics, which is more than I can say for this pinched, withholding and completely imbecilic remake courtesy of Kenneth Branagh and Harold Pinter. 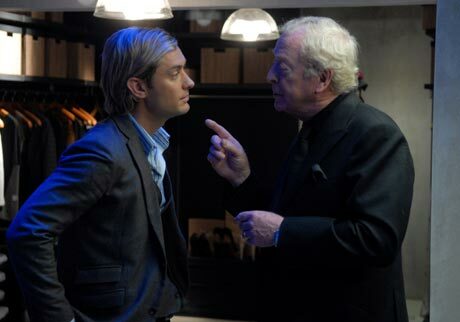 Why anyone thought that a grand, popular trick play needed to be made more serious is beyond me but Pinter does his deadly best to take the story  about an aging mystery writer (Michael Caine, a veteran of the first film) and the young man (Jude Law) whos stolen his wife  and spin it into clipped, portentous babble. Gone are the jolly jabs at the whodunit genre and the playful romping through an overstuffed mansion, replaced with what would be perceived as a parody of the Pinter style were it not presented with total humourless sobriety. The title is rendered meaningless, the final act is completely nonsensical and the house is now an ultramodern, cool Britannia mens room of a place that has no surprises and no bits of business. Throw in the authors usual obsessions with "shocking homosexuality and conniving women and youve got a portrait of an author on autopilot after a few drinks. Nothing about the movie is fun and I dont get why the original material needed such a tone upgrade.